Saas-Bahu fights are quite common in every household in India. The two main ladies of the house do have arguments on different issues but it remains behind closed doors and it’s the family bond that keeps the relationship intact. 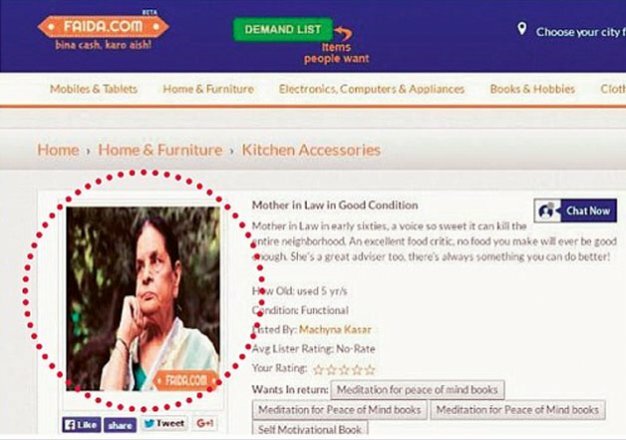 But, in a recent incident, a lady spilled the family tussle into cyberspace by putting her mother-in-law on sale on a barter website Faida.com. She posted the advertisement under the tagline “Mother in-law in Good condition” and asked for a book on mental peace in exchange for her. However, the post was removed within 10 minutes of being uploaded on the internet, but it certainly showcased the ugly side of a mother-in-law and daughter-in-law relationship. Last year also, a similar case hogged the limelight when a woman posted her husband’s photo under the “pets and pet care” section on Quikr.com. However, as per legal experts, venting of marital frustrations in cyberspace can come with some serious legal repercussions.